So, after Calamity Town, a step back to the screwball comedy. Ellery returns to New York City, and he and his father are involved with a duel and double murder involving a wacky, wealthy family. Oh, and the novel catches up with events in the radio shows, movies and comic books: this novel introduces Nikki Porter, Ellery’s secretary sidekick. “A premeditated murder is not unlike a child. First it must be conceived, second, gestated; only then can it be born. The Old Woman of the title is the powerful matriarch of a ubiquitous shoe company. Her first husband, and father of three of her children, went missing several decades ago. Her second husband, and father of three of her children, remains on the mansion grounds, playing checkers constantly with an old friend. The Old Woman’s business acumen includes, after one son’s murder, knowing that stock in her company will drop, so she sells, only to buy back at a much lower price. The whole world of the Potts family is portrayed as a very strange dream. At one point, for instance, Ellery observes, “Dinner was served in a Hollywood motion-picture set by extras – or so it seemed to Ellery, who sat down t o the most remarkable meal in his life.” Money, of course, can not buy sanity, but it can lend itself to a surreal life. The oldest three children are especially interesting for what they say about attitudes of 1943, and how those attitudes have changed over time. All three are obviously played for laughs. Their raisons d’être, their lifestyles, are so weird, so out of the ordinary, no rational person could ever take them seriously. However, they would fit right in with our world. The elder child, Thurlow, is proud of the family name and reputation, so much so that he is currently suing people for anything and everything that offends him. He requires decorum and “proper” behaviors in all things. Today, of course, people sue at the drop of a hat, and are generally offended anytime someone else opens their mouth. Thurlow would certainly fit in today’s world. His brother, Horatio, has determined he will never grow up. He surrounds himself with objects from his childhood – games, toys, books which time expected him to shed. Horatio will have none of the silly growing up thing, as has even built himself a giant playhouse on the estate grounds, where he spends his days writing children’s verse. Do I really have to explain how many people try as hard as they can to hold on to their cherished childhood? e-Bay alone does a brisk business in the childhood nostalgia market. I wonder, is this blog part of that, too? So, these three siblings are clearly ahead of their times. The younger siblings, from the se cond marriage, are, tragically, nothing more than products of their times. Twins Robert and Maclyn are serious minded businessmen who run the family’s financial affairs rationally and successfully, and are generally admired and respected. The twins are murdered, and their likes have not been seen since. Their pretty, intelligent younger sister has no problems, is secretly engaged to the young and dynamic family lawyer, and in the end even changes her name to avoid the stigma of being a family member. So, perhaps in writing a novel where characters common in the future are ridiculed the cousins were trying to step away from the great forward movement they made with Calamity Town. 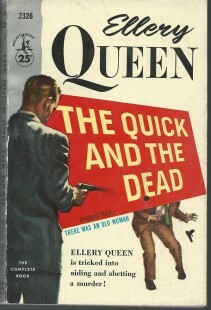 Even if they were, There Was an Old Woman is a better read than the cousin’s late 1930s efforts. 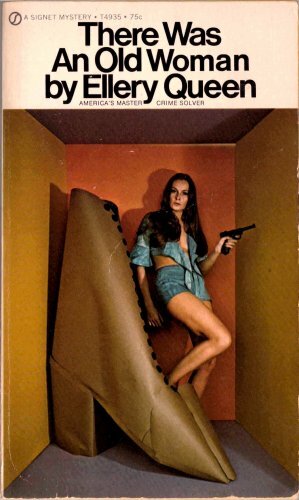 Also, they were getting in line with the radio shows and such with the character of Nikki Porter: this is her origin tale, the “paternity of the crime,” if you will, of how Ellery’s quick-witted sidekick secretary was really, at one time, a shoe-fortune heiress. Most reviews of this book say it is more like the earlier puzzle oriented stories than the more literary Calamity Town. Despite putting the series in stage Nevins’ division of the different styles of novels for certain times periods is not entirely as cut and dried as one would think. Have not read this book,book it sounds similar to Tragedy of Y.Do you agree with that? As for Nikki Porter,she appears in at least one other novel,The Scarlett Letters which was written in the 1950s. It does not reference any of her background,but it does not contradict it either.